Jean-Michel Kibushi Ndjate Wooto (also know as Kibushi Ndjate Wooto and Jean-Michel Kibushi) is a pioneer of African animation, and is widely considered to be the first Congolese animator. Kibushi was born in 1957 in Lubefu, and grew up in Tshumbe, in Zaire (present day Democratic Republic of the Congo). 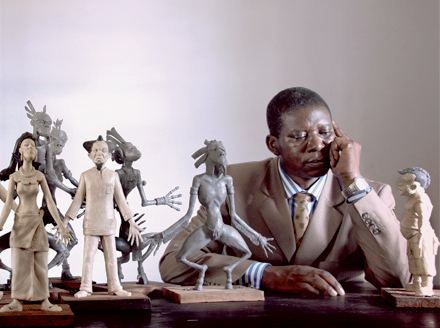 Kibushi studied drama and cinematography at Kinshasa’s National Institute of the Arts from 1985 to 1989, during which time he was introduced to animation by the Belgian production company Atelier Graphaoui. In 1988, he created the first local mobile studio for animation, Studio Malembe Maa, meaning “slowly but surely” in Lingala, the local language of the DRC. 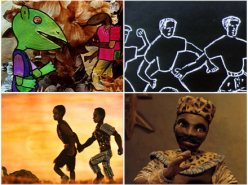 In 1991, Kibushi created the first Congolese animated film, Le Crapaud Chez Ses Beaux-Parents (Toad Visits his In-Laws), a stop-motion film interpretation of a Tetela oral tale from his own childhood. His next work was the documentary animation Septembre Noir (Black September)in 1992, which recounts Kinshasa’s 1991 military coup through the voices and drawings of children who lived through it. Kibushi’s work continues to this day — whether framing socio-political struggles or local perspectives though his rich, tactile animations, or enabling and advocating arts education in the DRC — and he remains a critical proponent of central African arts and culture.